and i wanted the whole wall to be crumpled cause someone "throw date in trash and then regret their decision lol"
YAAAY i was so waiting for thiiis! 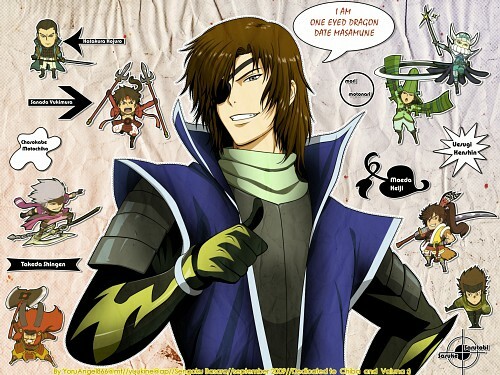 You always put a smile on my face when it comes to anything Sengoku Basara related! Though...I still want my Yukimura punching doll! lol XD awesome idea. I really love how you added on Date's arms, it looks absolutely perfect. I like the chibies and the idea of them being stickers. The only part I don't love is the shapes with their names. I like the arrow ones but I think it would be also interesting to see what it would look like if you made it look like someone wrote their names (or maybe like they signed their own names with different fonts for each of their different handwriting?). this looks really really funny.i love it!